Well hello there….. It’s been quite a while since I posted to the website after taking more of a backstage role managing the website rather than publishing it. I trust all our visitors are well and enjoying life? 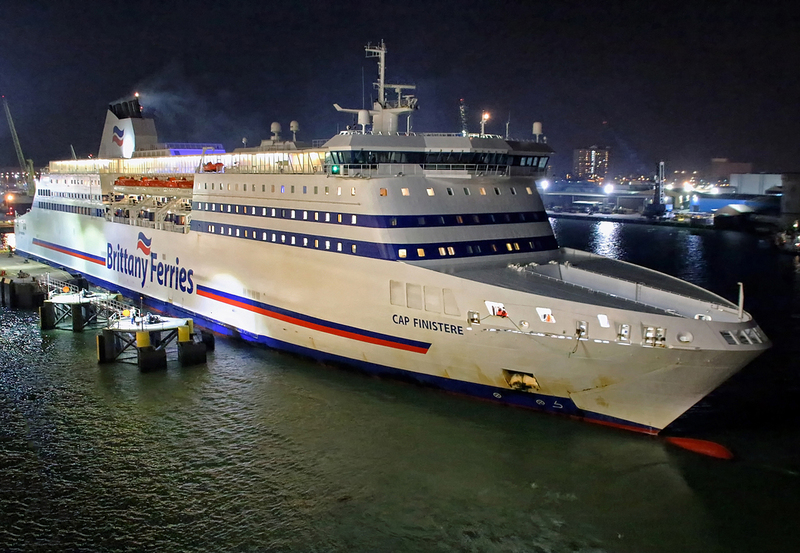 I am just in the process of finalising plans to visit Portsmouth this coming weekend (3rd-4th June 2017) with my fianceé and some friends when I suddenly realised that I hadn’t posted the photographs from our last visit back in February when myself and Paul Cloke travelled on Brittany Ferries Pont-Aven to St Malo, returning on the Armorique from Caen, hence the title, ‘the ones that got away’. The winter months on the Western Channel are always quite interesting when it comes to refit cover. 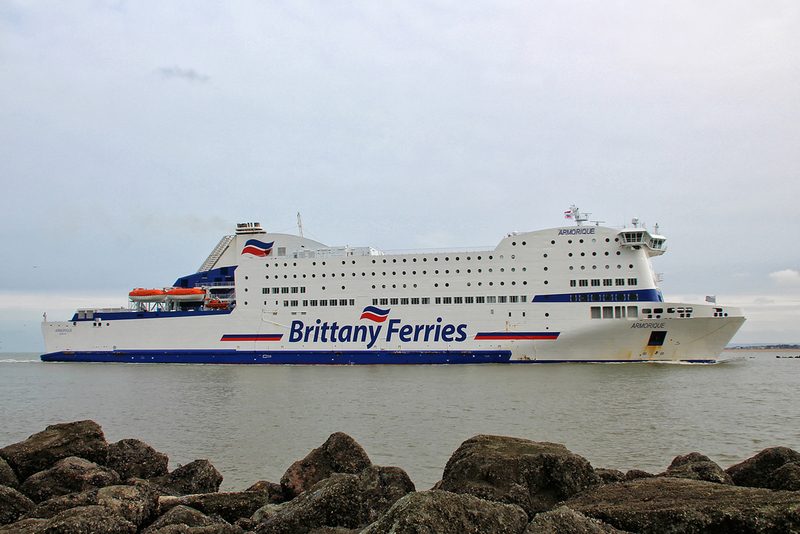 The Pont-Aven (usually to be found operating the Spanish, Irish and Plymouth-Roscoff services) was covering for the Bretagne on the St Malo route and the Armorique (usually found operating the Plymouth-Roscoff service) was covering for the Normandie on the Caen route. 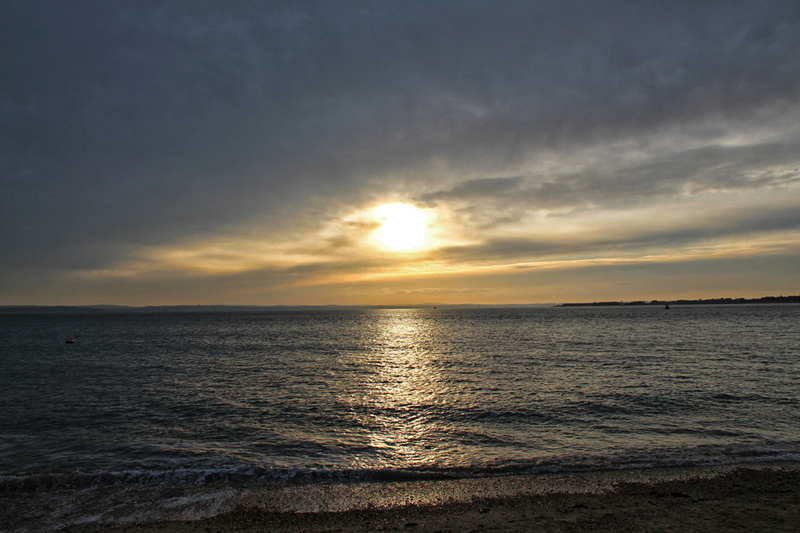 The weather for mid February, although cold, was absolutely perfect and I hope that comes through in the photography. If we had travelled just a few days earlier we would of experienced late running due to adverse weather. Anyway, as I mentioned earlier, I will be in Portsmouth this coming weekend to show my other half some of the sights of this vibrant city. She is a native Northern Irelander and this will be her first time on the South Coast so we will be doing the tourist trail. We have Afternoon Tea booked for the Spinnaker Tower on Saturday afternoon (you know you are getting older when you have afternoon tea instead of spending the afternoon in the Still & West! ), followed by dinner and drinks in Southsea with some Dover friends who just happen to be in Portsmouth the same weekend and on the Sunday we will be visiting the Historic Dockyard so expect some shore based photography in the near future. Until the next time, best wishes. 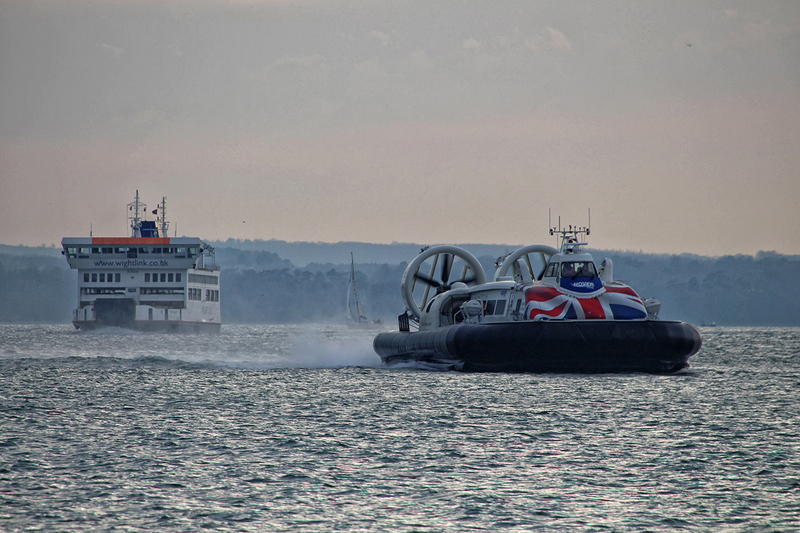 Having completed an emergency u-turn back to Swanley we were once again on our way to Portsmouth and soon we were on the beach at Southsea to witness the arrival and departure of one of the new Hovertravel hovercraft, the Solent Flyer. 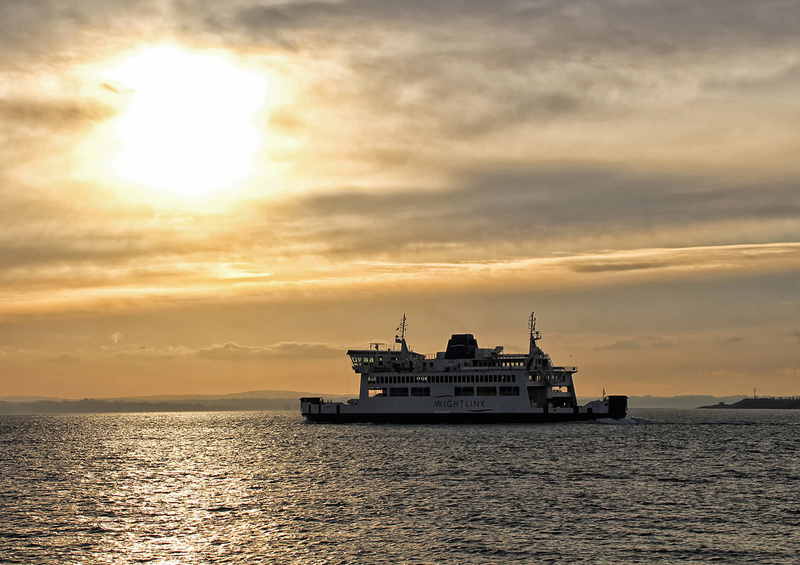 After this we just had enough time to watch the sun setting over the Solent before heading to the International Port to check-in for our departure to St Malo on the Pont-Aven. We arrived at the port to find that the check-in for our sailing was already open. 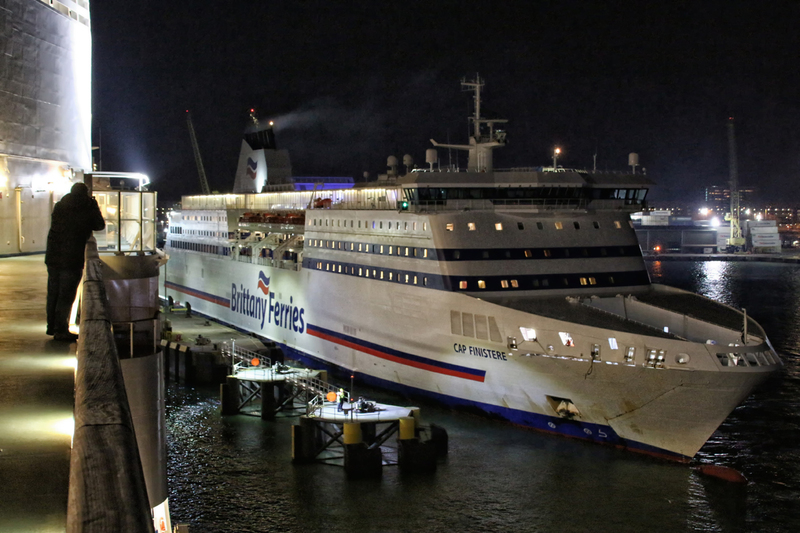 It looked as if the port was going to have a busy evening with Brittany Ferries checking in vehicles for Le Havre, St Malo, Caen and Bilbao. 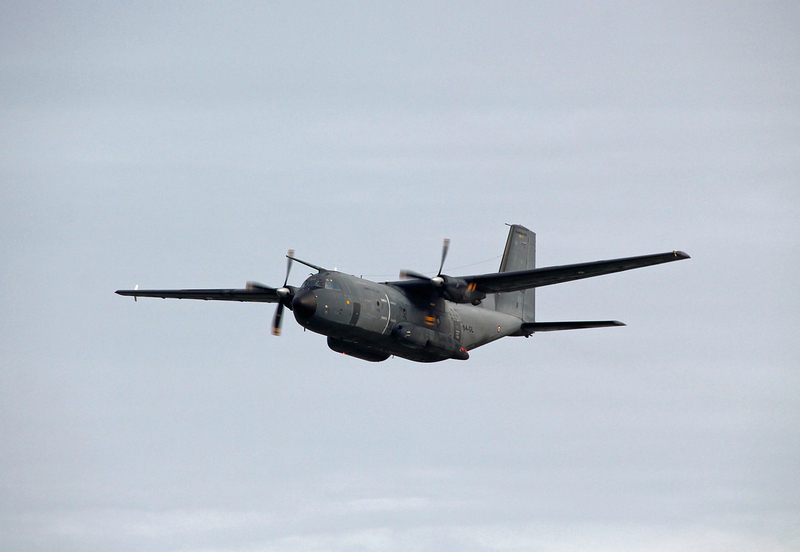 The Bilbao sailing was actually running significantly late due to adverse weather in the Bay of Biscay. 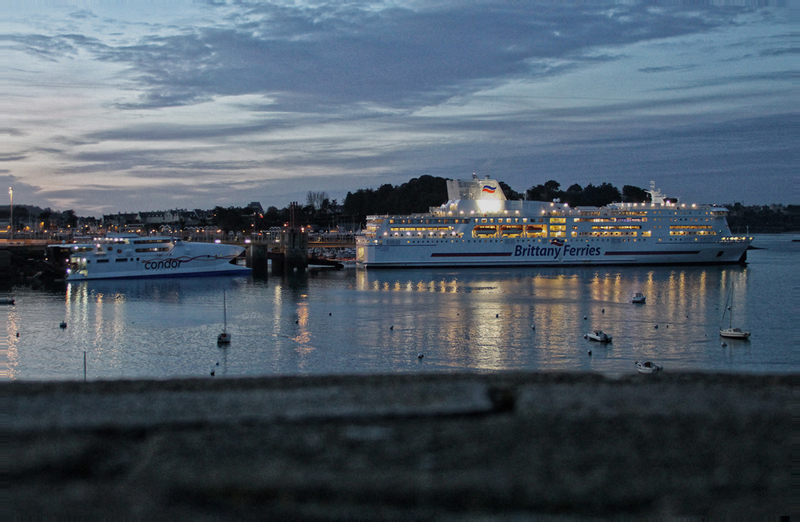 One of the nice things about the overnight crossing to St Malo is that ‘early boarding’ is quite often offered to vehicle passengers. 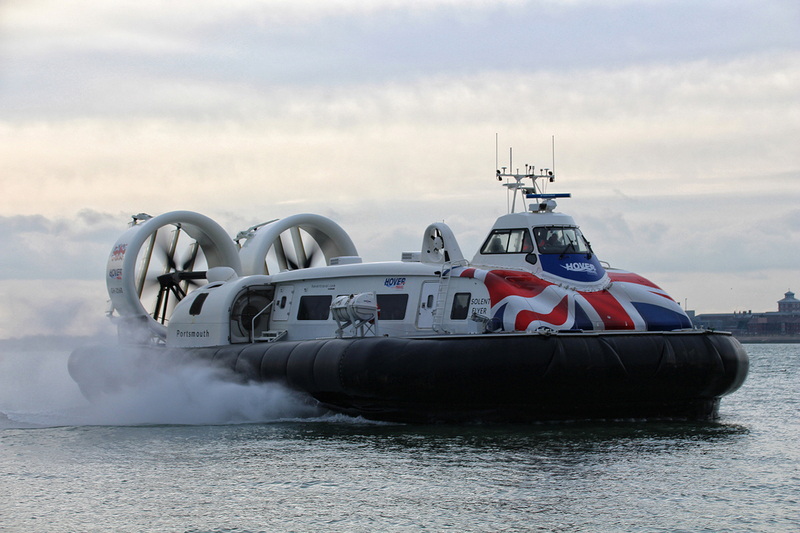 This enables you to get settled into your cabin before departure from Portsmouth. 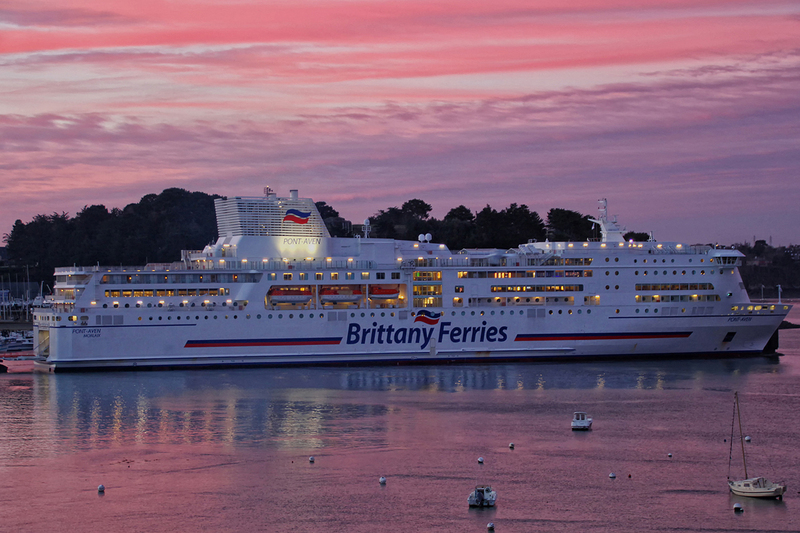 In our case we boarded the Pont-Aven at 18:45, well ahead of our advertised departure time of 20:15. 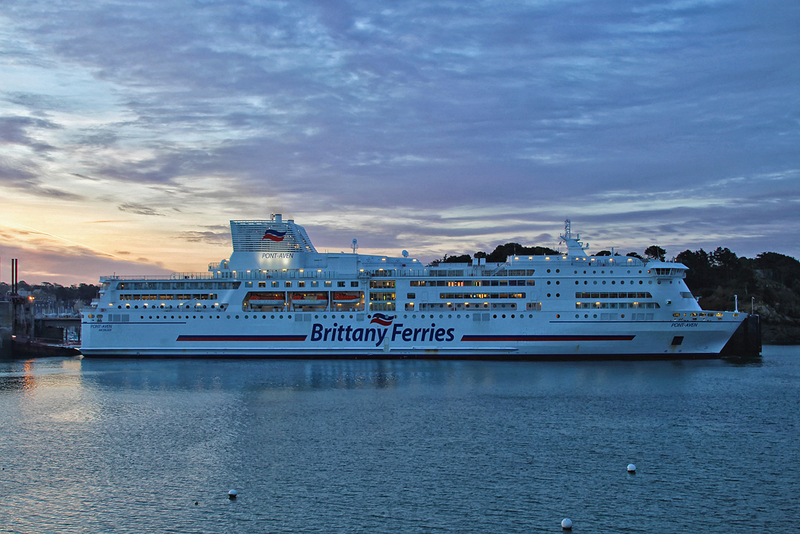 We last travelled on the Pont-Aven from Plymouth to Roscoff back in April 2016 just after the vessel had resumed service following a multi million euro refit in Gdansk, Poland. 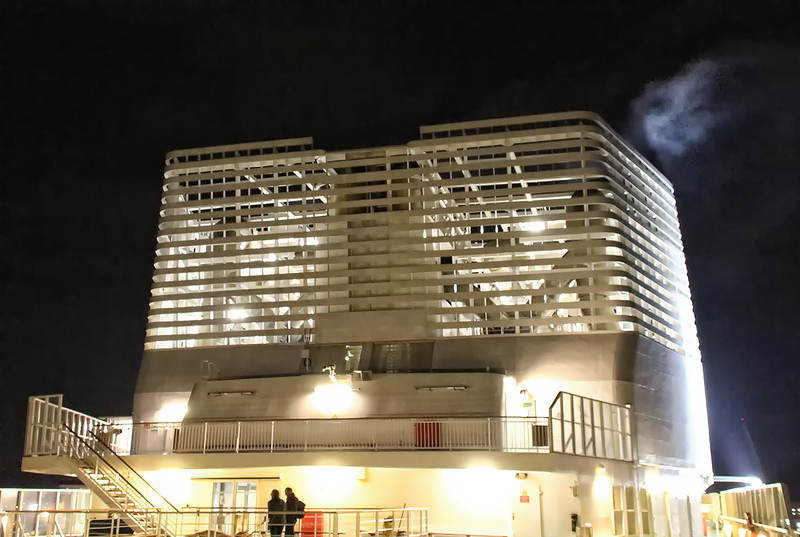 As well as receiving some interior upgrades the vessel underwent a major mechanical overhaul which included the fitting of an exhaust gas cleaning system (‘Scrubbers’) which necessitated some rather extreme cosmetic surgery to the ship’s funnel casing. Some may say that the new funnel enclosing these ‘scrubbers’ is certainly not as elegant as the old one, some may even call it hideous but it serves a purpose and anything that helps the environment has to be a good thing. Having found and settled into our cabin we soon headed up on deck for a spot of fresh air. 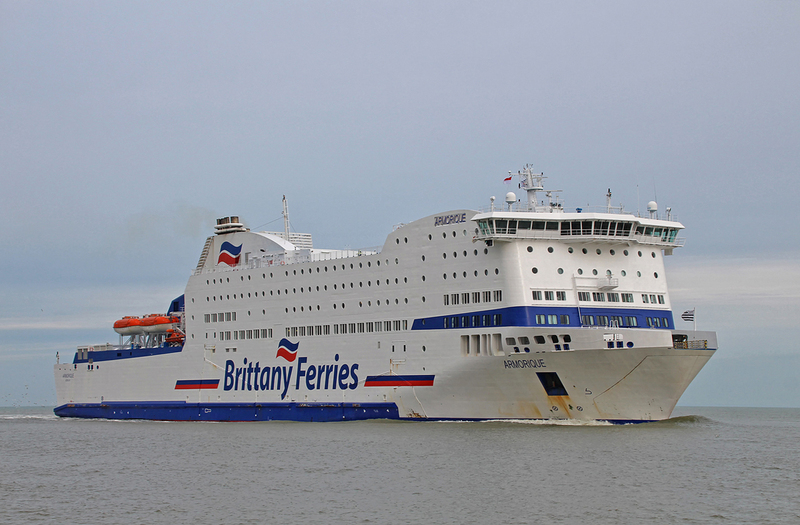 As I mentioned earlier the Cap Finistere was running late due to adverse weather in the Bay of Biscay and we were able to capture her arrival. Now I will be the first to admit that my night photography skills are not brilliant, especially not without the use of a tripod and remote release cable but I think the photographs came out alright. With the chill of a Winter’s evening really starting to get to the hands (numb fingers and photography do not, excuse the pun, go hand in hand!) we headed back inside for some food. 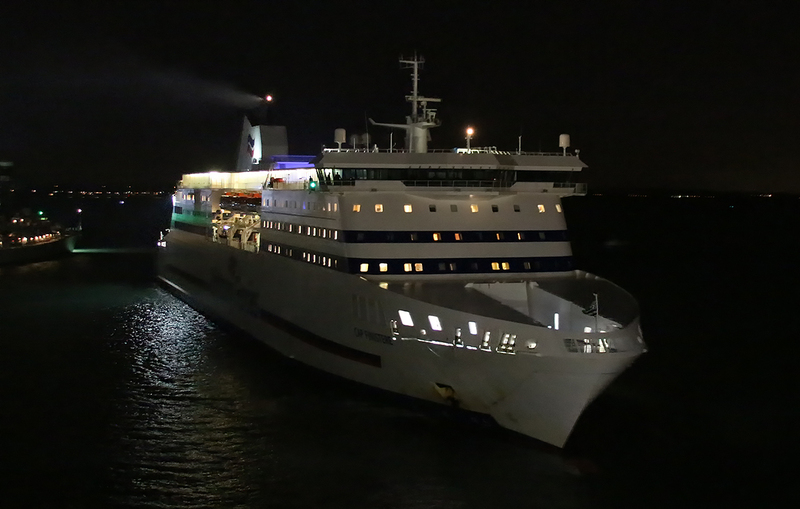 Just after arrival in the restaurant there was an announcement stating that our departure from Portsmouth would be slightly delayed due to shipping movements within Portsmouth harbour, as a consequence we didn’t depart from our berth until 20:50. Shortly after departure we passed the inbound Mont St Michel from Caen and the Etretat inbound from Le Havre and as we headed out into the Solent. Having had an early start and with the prospect of an 0430 wake up call it was time to call it a night. 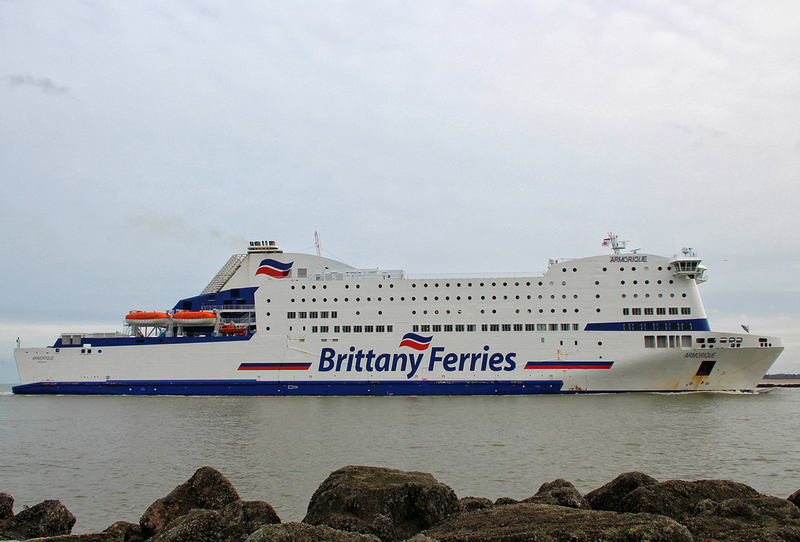 The aforementioned ‘new’ funnel on the Pont-Aven as seen from the rear sundeck. Two scrubber units were installed on the vessel, one either side of the ship’s original funnel housing (which can still be seen in the center). The scrubbing units and their associated pipework were then encased within the new funnel structure. 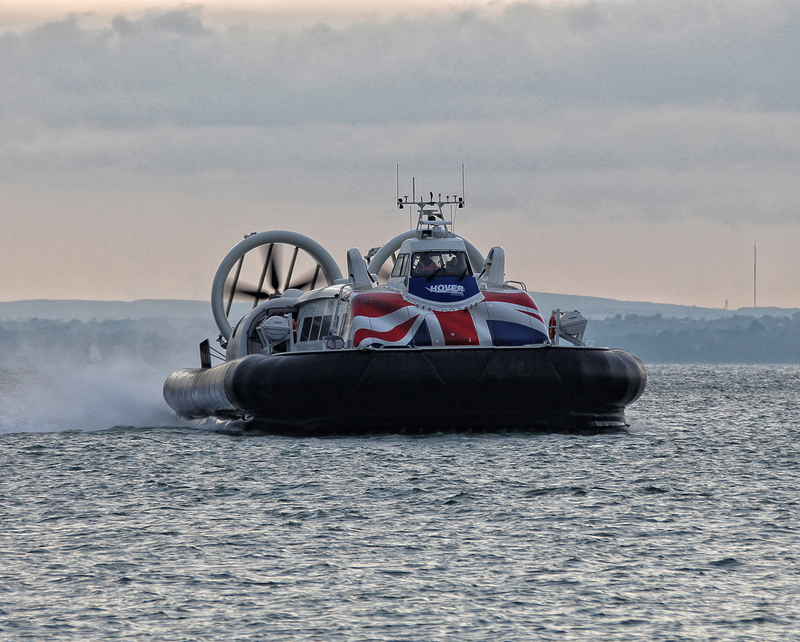 The overnight crossing from Portsmouth was fairly comfortable but it did get a little bumpy in the early hours as we passed the Channel Islands. 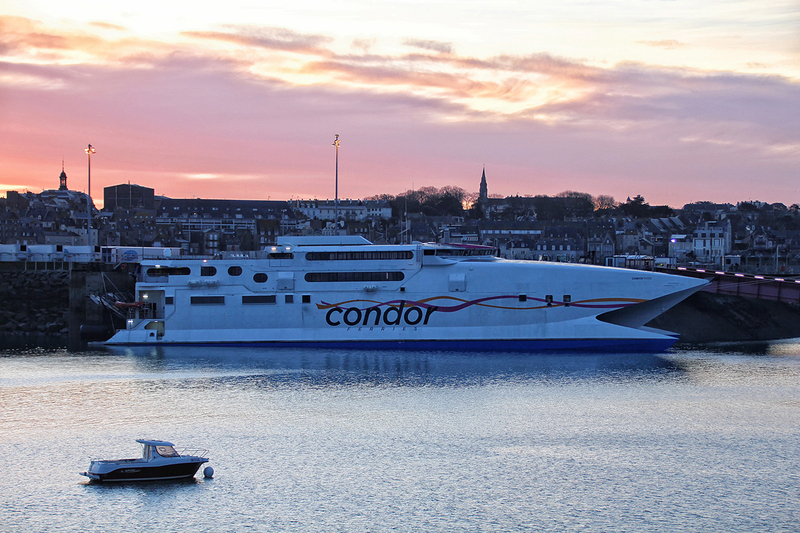 The usual arrival time into the port of St Malo is around 08:15 but due to tidal conditions we arrived in port at 06:15 local time (05:15 GMT) and disembarkation proceeded shortly afterwards. 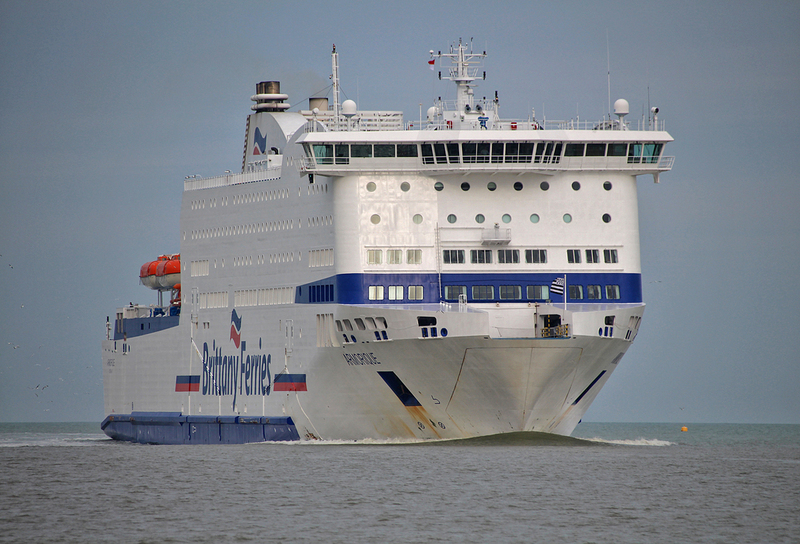 The one thing that is very noticeable travelling on a Sunday at this time of year (low season) is just how quiet some of the sailings can be. 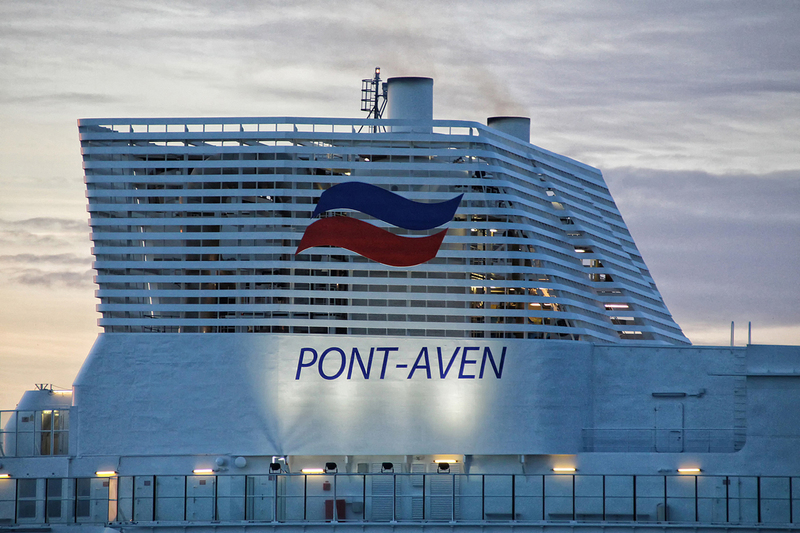 For a ship designed to carry 2,400 passengers the Pont-Aven felt almost like a ghost ship with only a couple of hundred onboard. Due to the early arrival we decided to give breakfast a miss and opted to eat at one of our regular eateries in the city instead. Those of you that follow our travels you will be well aware that we are frequent visitors to the city of St Malo so having disembarked we headed to the intramuros (the walled city) to photograph the sunrise over the Breton port from the city’s medieval walls. After breakfast it was time for an unrushed gentle 115 mile drive from St Malo to Ouistreham. We stopped at Avranches on route for a stroll and some proper decent coffee (not a Costa or Starbucks insight thankfully). Having arrived in Ouistreham and with plenty of time before we were required to check in for our return crossing to Portsmouth we decided to head to the Rivabella beach at Ouistreham to capture the arrival of the Armorique. The wide sandy Rivabella beach at Ouistreham forms a part of what was Sword Beach during the D-Day landings on the 6th June 1944. Sword beach was one of the five main landing areas along the Normandy coast during the initial assault phase of the allied invasion of German-occupied France. Stretching 5 miles from Ouistreham to Saint-Aubin-sur-Mer, the beach was the easternmost landing site of the allied invasion. Taking Sword beach was the responsibility of the British Army with sea transport, minesweeping, and a naval bombardment force provided by the British Royal Navy as well as elements from the Polish, Norwegian and other Allied navies. Among the five landing beaches, Sword beach is the nearest to the strategic city of Caen, being located just under 10 miles from the primary goal of the British 3rd Infantry Division. The initial landings were achieved with relatively low casualties, but the advance inland from the beach was slowed by traffic congestion and enemy resistance in heavily defended positions behind the beachhead. Further progress towards Caen was halted by the only armoured counter-attack of the day, mounted by the 21st Panzer Division. Following the arrival of the Armorique it was time to travel the short distance back to the ferry terminal to check in for our 16:30 crossing back to Portsmouth. Following the usual formalities we were soon driving onto the upper car deck of the ship. 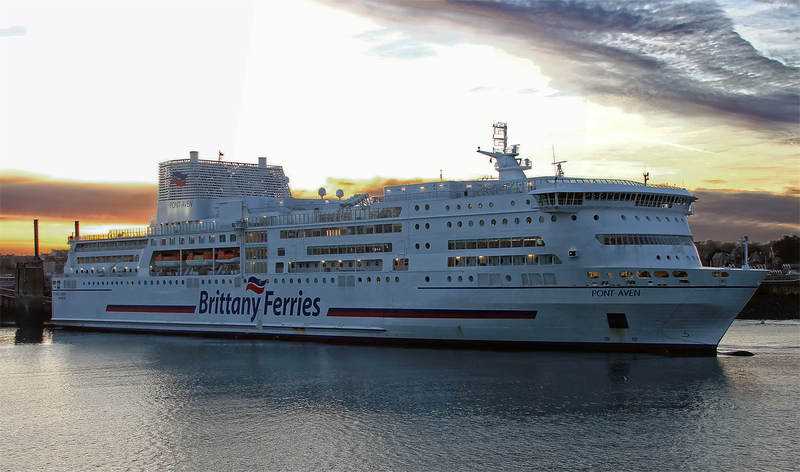 The Armorique was constructed in Helsinki, Finland in 2009 for Brittany Ferries Plymouth-Roscoff service. 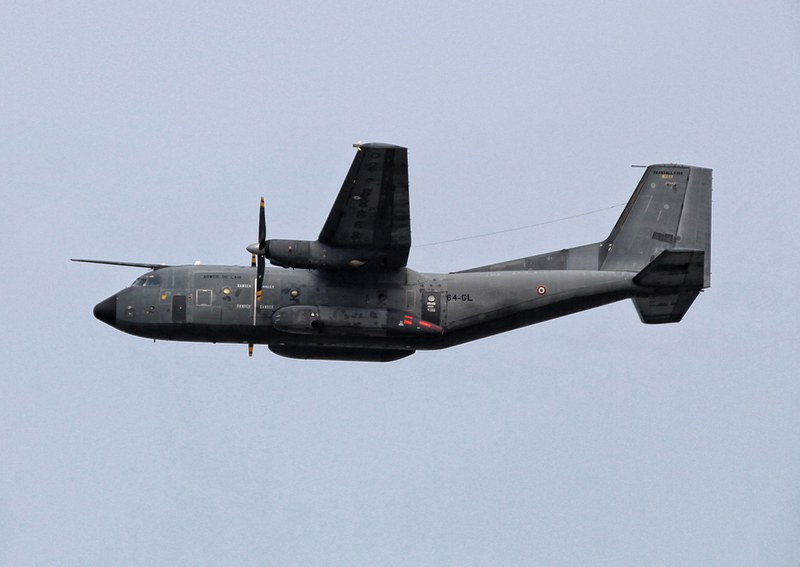 In recent years she has become the companies ‘flexible friend’ capable of operating on any of the companies routes. 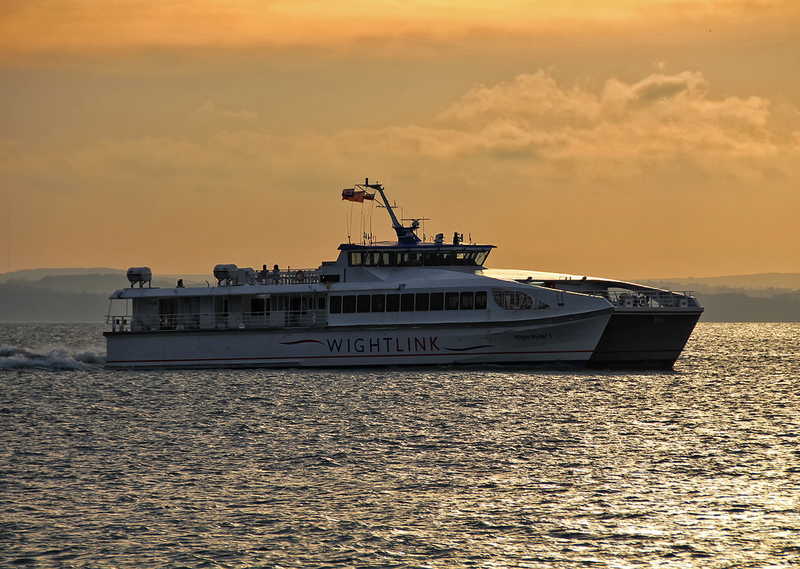 During the winter she is often found covering the Poole-Cherbourg, Portsmouth-St Malo and Portsmouth-Caen operations. This was my first trip on the Armorique and I found her to be a well laid out vessel with a good internal fitout. Apart from her not having a formal restaurant she has all the facilities you would expect to find on a Brittany Ferries vessel. Despite this being a day crossing we had booked a cabin, at £21 it gives you a place to put your bags and to get your head down on the nearly 6 hour crossing and with the earlier than planned start at St Malo a couple of hours sleep was very welcome. During the journey back to Portsmouth the weather closed in with a strengthening Southwesterly wind and heavy rain. Despite the inclement conditions the vessel handled the weather well with very little movement from the developing swell. All too soon we were arriving into a rather damp and windswept Portsmouth ferry terminal at the conclusion of another crossing with Brittany Ferries. All in all it was a nice way to spend a Sunday and Monday and it gave me the chance to experience a different ship. All photographs on this page were taken with a Canon EOS 700D mounting a Sigma 18-300mm lens.